Jervis Bay Accommodation: Where Should I Stay? With many things to do in Jervis Bay, it isn’t surprising that it’s a favourite destination, not only for families, but outdoor enthusiasts as well. You can hire a kayak or a SUP, explore the restaurants and cafes, take a dip into the clear blue water, walk on the white sand beaches, or take a dolphin spotting or whale watching cruise. To make your holiday even more memorable, be sure to choose the right Jervis Bay accommodation. Here are the some of our favourites. Located just a few minutes from the pristine white sand beaches of Jervis Bay, Worrowing is a historic 250-acre coastal farm providing accommodation for all holiday-goers. The property offers a range of accommodation, from studio-type rooms to a five-bedroom beachfront house. It also makes a great venue for a wedding or other special event. If you want to go glamping in Jervis Bay, then Paperbank Camp will blow you away. This peaceful bush retreat features 12 safari-style tents, nestled among paperbacks and eucalyptus trees. All of them feature a wrap-around veranda, combining the bush camping experience with luxury and privacy (think freestanding baths-with-a-view and the latest in contemporary furnishings). The unique Gunyah restaurant serves breakfast and dinner, as well as drinks and nibbles, so you can watch the stunning colours of the bush as the sun sets. Just four minutes away by foot from the beautiful Collingwood Beach, Dolphin Shores has eight different types of rooms, from a standard motel room to a three-bedroom, two-bathroom luxury townhouse. Dolphin Shores is also only a three-minute walk to one of Jervis Bay’s shopping hubs so you can easily grab a coffee or some groceries. 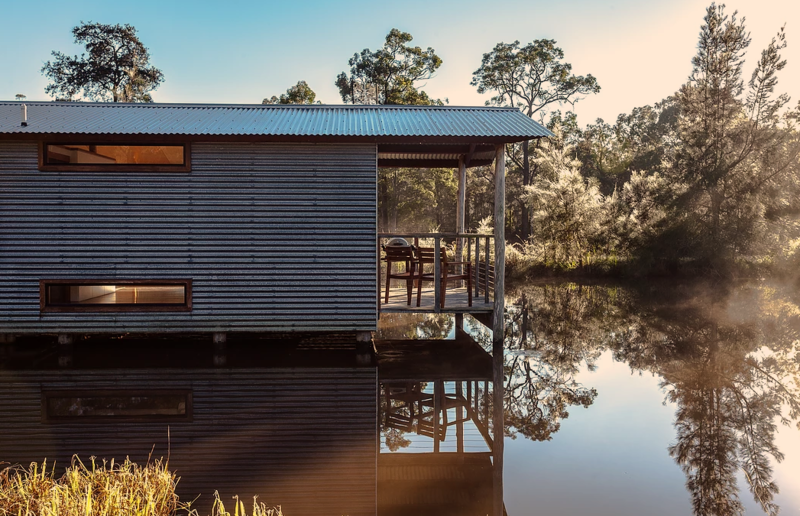 Bewong River Retreat provides the perfect getaway for those who want to surround themselves with nature. Nestled among temperate forest and lush gardens, visitors get to experience a feeling of seclusion and utmost privacy. Bewong River Retreat has luxury cottages and bungalows that will make your stay a comfortable and pleasant one. Dolphin Sands B&B, only a few minutes walk from the heart of Huskisson, has five comfortable and contemporary rooms. Strictly for adults, you can be confident of a relaxing and peaceful stay. The private gardens, open-air dining area and delicious, locally sourced breakfast, add a touch of luxury to this idyllic B&B.